Most people know that Mona Lisa painting is created by Leonardo da Vinci, but the identity of the woman still remains unknow. Some people even think it is Da Vinci in female form. But the most commonly believed is Lisa Gherardini, born in 1479. She was 24 years old and the mother of two sons when she posed for the painting. Why he chose her is still a mystery. The original name of the painting is Monna Lisa, it was a common italian shortening of Madonna, meaning "my lady." But can you believe it, the most recognized name of this painting now is because of a spelling error(Mona Lisa). In 1956, a man named Ugo Ungaza threw a rock at the painting, which resulted in a small patch of damaged paint next to her left elbow. The unrivaled fame of this work is partially because it was stolen from the Louvre Museum in Paris in broad daylight by an employee in 1911. It was quickly recovered two years later. The painting now is in the Louvre Museum in Paris and is portected in a climate controlled environment and encased in bullet proof glass which caused seven million dollars to built the room. The painting is considered priceless and cannot be insured. There is a rumor that Mona Lisa has no eyebrows in the painting because when they were trying to restore the painting, they made an error and removed the eyebrows accidentally. However, ther are others think that Da Vinci never finished the painting because of he was the consummate perfectionist and also because most of Leonardo’s paintings were left unfinished. There are three different versions painted under the presently viewed version. One version has her hands clutching the arms of the chair instead of in front of her. Da Vinci started to work at this painting in 1503. He spent four years on the portrait. It is painted on 77 x 53 cm poplar wood. He never sold the portrait. 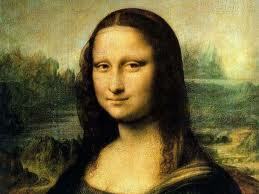 It has been suggested that the portrait of the Mona Lisa is in fact Leonardo's female version of himself. August 22, 1911 - Mona Lisa was stolen but soon recovered. In 1956 an acid attempt damaged the lower half of the painting, the restoration took several years.